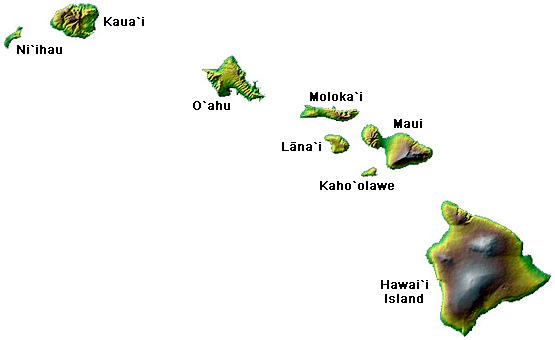 Hawai`i is the longest state in the US: stretching over 1,523 miles (2,451km) and still growing. Number 2, Alaska, is 1,479 miles long (2,380 km), north to south, and California, is only 770 miles long (1,239km). Hawai`i is home to the tallest mountain on earth: Mauna Kea, on Hawai`i Island, is 33,465 (10,203m) feet tall from sea floor to summit, 13,796 feet (4,205m) above sea level. Mount Everest is the highest mountain on earth at 29,029 feet (8,848m) above sea level. And home to the largest mountain on earth: Mauna Loa, on Hawai`i Island, has an estimated volume of 18,000 cubic miles (74,000 cubic km). Deep below the floor of the Pacific Ocean, lies a fixed volcanic hotspot where Pele, the Goddess of Fire, lives. This is the source of the entire Hawaiian archipelago, formed as the Pacific Plate moved north, and then northwest. As the Plate moved and continues to move, about 3.5 inches (9 cm) a year, Pele has constantly built new homes above the surface. Eventually, erosion returns her islands to the sea, first as coral-capped atolls, reefs and, ultimately, as seamounts hidden below the surface. Pele's current home is on Hawai`i Island, where she continues to create new land with Mauna Loa, Kīlauea and Lō`ihi volcanoes. 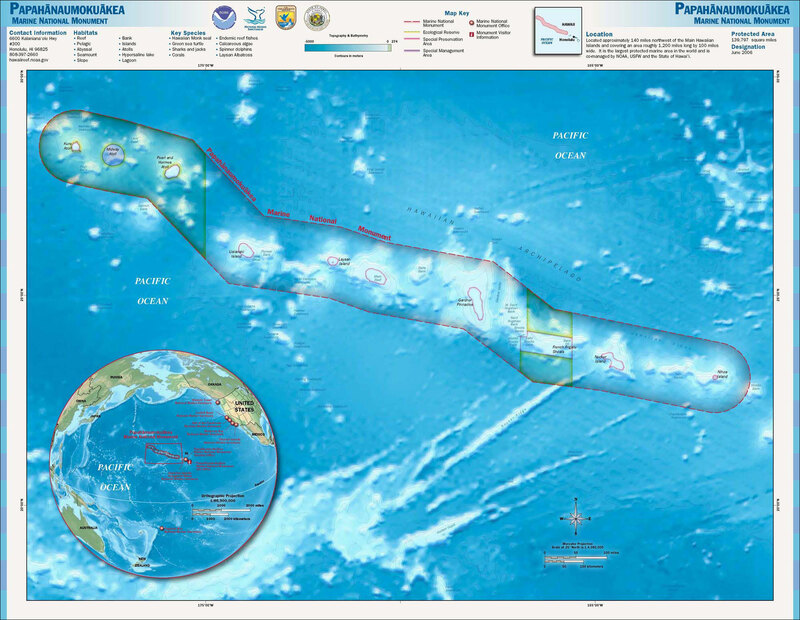 The Northwestern Hawaiian Islands, Papahānaumokuākea, includes more than 120 islands, atolls and reefs, starting from Nihoa Island in the south to Kure Atoll in the north, 1,200 miles away. 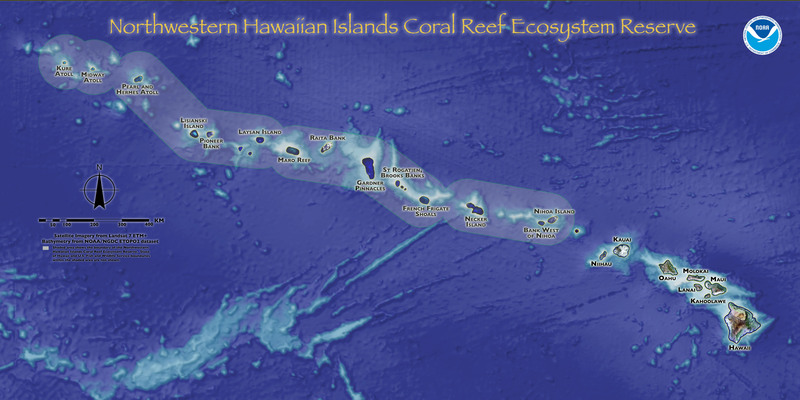 This entire coral reef ecosystem is now a protected Marine National Monument. Click on name or island for more information. 19 miles (34 km) southeast of Hawai`i Island, the newest Hawaiian volcano is taking shape. 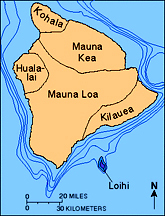 There, Lō`ihi joins Mauna Loa and Kīlauea as one of Hawai`i's three active volcanoes. Lō`ihi seamount rises 10,000 feet (3,000 m) from the bottom of the sea, yet its summit still lies 3,200 feet (975 m) below sea level. The summit currently has three craters. The largest, formed in 1996, is called Pele's Pit and is 660 feet (200 m) deep. Scientist do not expect Lō`ihi to reach the surface for tens of thousands more years.